Meg Barker reflects on recent debates about relations between bisexual and lesbian women in DIVA magazine, and considers wider issues of the ways in which we engage with such divisions within our communities. Back in January Louise Carolin, one of the team at DIVA magazine, decided to write a piece about relationships between bisexual and lesbian women. She wanted to explore the fact that some lesbians are cautious about dating bisexual women, or even have exclusion criteria around bisexuality, and also about the sense of rejection and marginalisation experienced by bisexual women who come across such attitudes within lesbian communities, or from partners or potential partners. Louise put a post up on the DIVA facebook page (January 18th 2012) entitled ‘why won’t some lesbians date bi women?’ and asked for comments from both groups. The post got 102 responses altogether which included a diversity of views. Of the original 80 comments, the majority were from lesbians and bisexual women who said they hadn’t experienced such exclusions or that they had good relationships; or questioning why it should make a difference whether someone is left for a man or for a woman and challenging myths around bisexuality. These positive comments received several hundred ‘like’ responses. There were also some accounts of painful experiences of infidelity or rejection, and some examples of biphobia (such as claims that there is no such thing as a bisexual person, or that all bisexual people are untrustworthy). There were fewer of these than the positive comments, and they were ‘liked’ less by other readers, but they certainly stand out for a bisexual person reading the comments. Louise also interviewed me, as one of the authors of The Bisexuality Report to talk about these responses and to reflect, as a relationship therapist, on potential ways forward for bisexual and lesbian women who do come up against these issues in their relationships. Following the publication of the article there have been several blogs and online discussions complaining about it (including two thoughtful posts on blogwasred and one on mercury_pheonix’s livejournal). Glasgow LGBT students’ association has demanded that DIVA reconsider their policies and practices around bisexual inclusion. Interestingly, they’ve suggested that DIVA editors read The Bisexuality Report – the very report that prompted them to contact me in the first place. Most of the commentators don’t have too many problems with the article itself (although I’ll address some that they do have below). Rather, their problem is with the way in which it the article is framed. 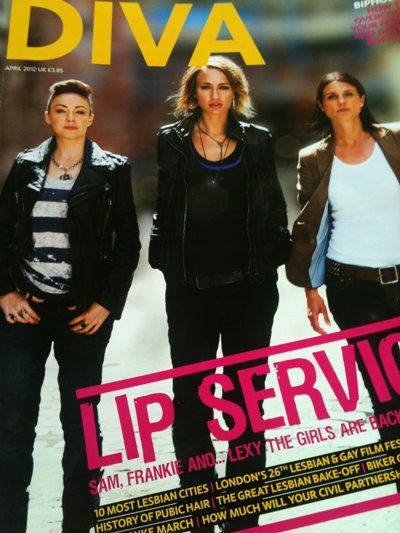 Whilst the title of the article is ‘why do you have to be a heartbreaker?’ (which could refer to either the bisexual or lesbian women involved in such situations), the front cover strapline is ‘bye biphobia – how to overcome your fears and date a bisexual’ which clearly suggests that intended readers are lesbians rather than bisexual women, despite DIVA being described as a monthly magazine ‘for lesbians and bi women in the UK’. Commentators pointed out that this is exactly the kind of bi invisibility which has been linked to feelings of alienation amongst bisexual people in countless studies. They were also concerned with the biphobic views expressed by some of the readers whose experiences were included alongside the article, and (in the case of the Glasgow LGBT student association) with an earlier piece of satire in the same issue of the magazine sending up the stereotype of bisexual people being ‘paralyzed by indecision’ (which could perhaps be read either as pointing out the ridiculousness of such stereotypes and/or as perpetuating them). I am very interested in these debates, not just because of the content – which has such relevance for bisexual visibility and for relationship conflict – but also because of the process of how the debates are playing out. These processes are reflective of so many conflicts that we have seen in recent years, within LGBTQ communities and more broadly, when issues of marginalisation, privilege and oppression are being discussed.